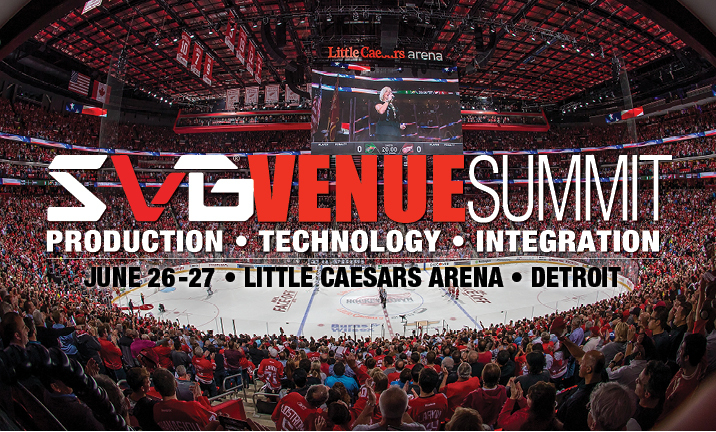 SVG has announced the full program for the 2019 SVG Venue Summit, which will be held June 26-27 at Little Caesars Arena in Detroit. Join us for an Opening Night Reception at the Detroit Foundation Hotel in Downtown Detroit on Wednesday, June 26, followed by a full day of panels and presentations — as well as a behind-the-scenes venue tour — at Little Caesars Arena on Thursday, June 27. Little Caesars Arena opened in 2017, and quickly became a hit with Red Wings and Pistons fans. Featuring the world’s largest seamless centerhung videoboard, the arena not only has plenty of video real estate but a top-notch team to entertain fans on every display in the building. Hear how that team crafted their game-day video presentation and the tools they use to make it possible. While the Little Caesars centerhung is certainly stunning, Detroit’s newest venue isn’t the only one in Southern Michigan with a videoboard — and video-production team — to boast about. Local teams take the stage to discuss their video-production tips and tech, and how they leverage video to engage with their fans game after game. Former buzzwords like 4K UHD and HDR have evolved into realistic options for in-venue production, and commercial 5G services are on the horizon. What would these technologies mean for your team? Leaders in these emerging technologies take the stage to share their experience, answer your most pressing questions, and discuss how they might enhance the fan experience. As video-control rooms expand in both size and scope, so too must the role of the systems integrator grow and evolve. Leading systems integrators will discuss their latest projects, the technological trends they’re seeing in sports venues, and much more in this open discussion. The SVG Venue Summit concludes with a look at the hottest emerging market in sports: esports. Esports arenas — designed with both the gamer and fan experience in mind — are popping up all over the world. Hear from those on the front lines as they discuss the unique requirements, the video/audio considerations, and the shifting mindsets that go into designing an esports arena. Little Caesars Arena is the cornerstone of The District Detroit, a 50-block sports and entertainment district that is contributing to the city’s comeback with new retail, office, and residential developments. Learn about the technological considerations that go into planning and executing an entertainment destination like The District Detroit, as well as keeping fans connected. CLICK HERE to register now for the SVG Venue Summit! CLICK HERE for more information on the event, including the full agenda, sponsorship opportunities, and more. In addition, the call for speakers for the 2019 SVG Venue Summit is now open! Bring your fresh ideas and unique perspectives on key trends and technologies driving the future of the sports venue production and technology. To submit a speaker for consideration at the 2019 SVG Venue Summit, email SVG conference coordinator Alicia Montanaro at alicia[email protected] with the with the speaker’s name, organization, title, and the specific session being requested, along with a brief summary of why the individual is qualified to speak on the topic. Note that this call for speakers applies solely to end-users and does not include technology vendors at this time.